Nikol Pashinyan was arrested after televised talks with Prime Minister Serzh Sargsyan collapsed. In a tense exchange, the opposition MP insisted the PM should quit and Mr Sargsyan accused him of "blackmail". The opposition object to Mr Sargsyan clinging to power after serving two consecutive terms as president. He was elected to the post by parliament on Tuesday, fuelling anger on the streets. 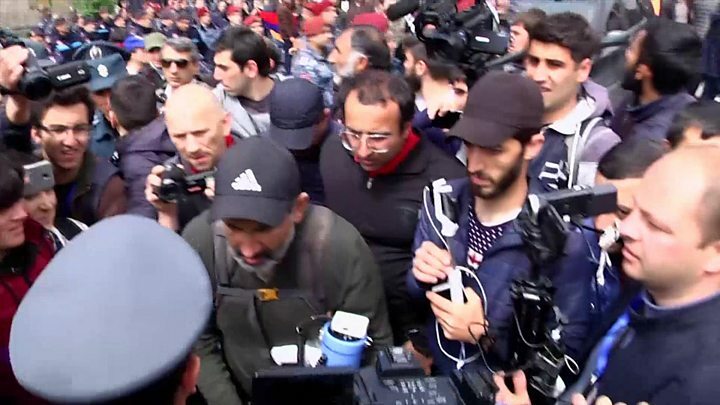 As well as Mr Pashinyan, two other opposition politicians and some 200 demonstrators have been held, leaving the protest movement without political leadership. The EU, which has a partnership agreement with Armenia, called on all sides to "show restraint and act responsibly". Armenia's biggest square is full of protesters. The detention of Mr Pashinyan and other opposition leaders did not stop protesters from turning up. They are holding placards that read "I am Nikol" and chanting his name, along with another slogan, "Serzh go". University student Elina Isahanyan, wrapped in the Armenian flag, says she has been participating in the protests for nine days. "My friends and I are not attending classes. This is our way to show to this new government that we want change," she says. "We are peaceful and we don't want any violence. We don't want the police to be against us." Buses loaded with police in flak jackets can be seen in the streets leading up to the square. The justice ministry issued a warning reminding citizens that the police have the right to disperse demonstrations regardless of the nature of the protests. Protests against Mr Sargsyan have been held in other parts of Armenia - the second largest city of Guymri and the city of Vanadzor. How did Sunday's meeting fall apart? Mr Pashinyan was previously jailed over his part in protests against Mr Sargsyan in 2008. He recently described the campaign he leads as a "velvet revolution", referring to the peaceful protests in 1989 that ended communist rule in Czechoslovakia. He met Mr Sargsyan at a hotel in Yerevan on Sunday morning, in the presence of dozens of journalists. The exchange was brief. After the prime minister said he was glad his rival had "responded to my numerous appeals to negotiate", Mr Pashinyan struck an uncompromising note. "I think there is a misunderstanding," he said. "I have come here to discuss the terms of your resignation and the terms of a peaceful and smooth transition of power." Mr Sargsyan said that "this is not a dialogue, this is blackmail" and left. Addressing the assembled reporters afterwards, Mr Pashinyan called on his supporters to continue their protests, which have continued for more than a week. He was detained shortly afterwards, as riot police using stun grenades dispersed protesters. His supporters then gathered outside a police station where they believed he was being held before they set off towards the capital's central Republic Square. Why is there such anger at Serzh Sargsyan? He has been accused of failing to address continuing tensions with Azerbaijan and Turkey, as well as widespread poverty at home. His government has also been criticised by the opposition for its close ties to Russia, whose leader Vladimir Putin also moved between the positions of president and prime minister to maintain his grip on power. While he was president, the country shifted from a presidential system to a parliamentary republic, vesting real power in the office of the prime minister. He stood for prime minister despite promising he would not. His supporters argue that the tough veteran of the Nagorno-Karabakh war with Azerbaijan in the late 1980s has provided the national security Armenia needs. Serzh Sargsyan, who served as president from 2008 until this year, has been left largely unchallenged for years because of a lack of clear rivals and alternatives, Armenian affairs analyst Richard Giragosian tells BBC News. "Pashinyan was the exception with his unique combination of charisma with a good sense of street politics, which only makes this current confrontation more serious." he says. The power of the ruling Republican Party is potentially even more dangerous as it "undermines the necessity for consensus and compromise". "The real question now is what lies ahead. After such polarisation and dissent, the launch of parliamentary politics seems destined to fail, undermined by an inherent lack of trust or public confidence." However the crisis plays out, "there is little or no foreign policy dimension", he adds. "It is not about Russia and not about Europe. It is local politics and economics." The small landlocked country saw an economic recovery last year, the World Bank reports. However, it is vulnerable to developments in Russia, its biggest trading partner after the EU and a major destination for its migrant workers.